In Greek, the word “Lykoi” means “Wolf.” A new, genetically engineered cat, the Lykoi, or “Wolf Cat,” is said to resemble a wolf — or, some say, a werewolf. These cats have long limbs and round, golden eyes, but the feature most unique and “wolf-like” is their hair coat, or should we say, lack of hair coat. Due to what researchers call a “naturally occurring genetic mutation” of the domestic short hair (DSH), the Lykoi is hairless around the mouth, nose, and eyes, while the rest of their body is covered only in patchy, sparse hair with no undercoat. Even the hair that does grow is prone to falling out periodically and growing back — and not necessarily in the same spot. In 2010, a Tennessee Sphynx breeder was presented with a litter of partially hairless kittens. They thought the kittens had a genetic relation to the hairless Sphynx, but research proved no genetic correlation. Further research revealed a rare, “naturally occurring mutation,” found only in domestic shorthair cats. The hair follicles in these cats lack the necessary components to grow and sustain hair. In addition, hair follicles on some parts of the body are missing completely. There is apparently no disease process involved, and breeders report these cats are lively and healthy. Behaviorally, Lykoi cats are just like many domestic cats: friendly, affectionate, intelligent, loyal, and often possess a strong prey drive. Some have called it a cat who acts like a dog. 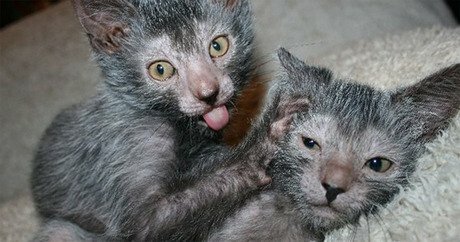 Breeders in Tennessee (and six others around the world) are busy producing more Lykoi cats by breeding cats with this genetic mutation with domestic short hairs. By using only black DSH cats, the coat is reported to look “more wolf like.” A process called “outcrossing,” or using different lines of black cats, should ensure continued health. The fate of the Lykoi remains to be seen. At present, though, two of the five steps required for recognition in The International Cat Association have been completed, and breeders hope the Lykoi will reach Championship status by 2016.